ConServ Epoxy offers structural and flexible wood rot repair epoxies that have long outperformed the competition. ConServ was originally developed and field tested over 30 years ago by wood conservation pioneers for use in their own projects. They made sure that this reliable wood repair system was also the most versatile, adaptable and comprehensive. 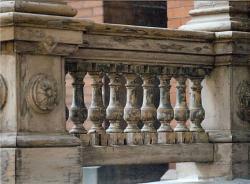 The ConServ system was developed by wood restoration professionals for use by other professionals. Applications performed over 30 years ago continue to endure on national landmarks and historic structures. We offer professional consulting, assessment and training services for wood decay conditions throughout the country and into Canada. Whether on site or over the phone, we can help you with the important aspects of planning and carrying out your project. Contact Us, and/or visit our service company Marlowe Restorations LLC, and let us help meet your needs for your restoration or repair. ConServ offers wood restoration epoxy systems that last longer because they stay flexible and move with wood to form a stable, long lasting repair. Our Epoxy Consolidants (100 and W100) and Wood Epoxy Patch/Fillers (200, S200, W200 and W300) work together to stabilize, rebuild, and help to prevent future rot in wood. Sometimes certain applications require a different approach. We offer our product Structural Epoxy Adhesive 552 as a versatile, caulkable formula that bonds to many surfaces. It is prepackaged in 450 ml dual-cartridges for ease of application with our static mixers. This is an ideal labor saving product which can be used to install our Fiberglass Rebar 800 series for structural connections. Also, we offer our Structural Epoxy Repair 600 for consolidating, casting, or made into a paste filler for structural repairs. The system can be used with aggregate and Epoxy Thickener to slow the cure and stretch the epoxy without compromising the performance. Over the years, close collaboration with experts in the field has helped to keep ConServ Epoxy products state of the art. ConServ Epoxy LLC’s owner, Paul Marlowe, is proud to continue a significant tradition of master installer ownership for ConServ Epoxy. He is also the owner of Marlowe Restorations LLC, a historic building preservation company based in Connecticut, and has been using the ConServ Epoxy system since 1987. Remember, ConServ Epoxy is the wood restoration and repair system developed by and for the professional wood conservator. Be sure to check out our Epoxy Question & Answer Blog for more information, and we welcome all questions and suggestions from the field!